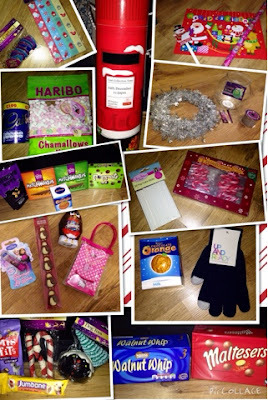 Life with Liv: Christmas 2014 with Poundland. So last week I was challenged by Poundland to spend £30 in store. Challenge? Really? Easy peasy! Yep, all of that totalled just £30! Here is more detail about what we bought. 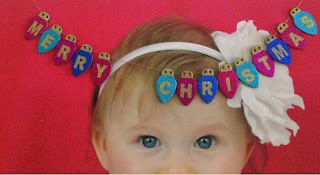 I liked the look of this Merry Christmas hanging glittery garland because our baubles are teal to match our living room and hot pink because Olivia loves pink. This matches the colour scheme well and hung over a canvas on the wall and I must say it looks lovely. 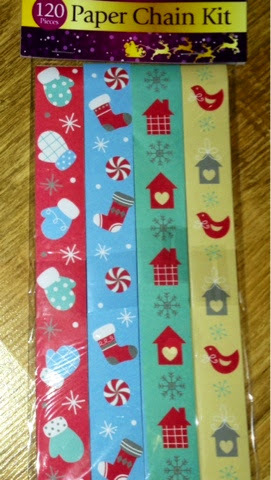 We also bought this paper chain kit. It has 30 red strips, 30 blue strips, 30 cream strips and 30 green strips pre cut all ready for you to transform into lovely paper chains. 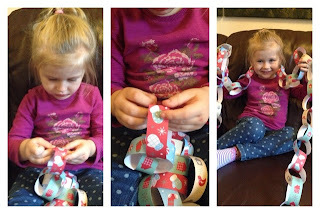 I cut some little pieces of tape up and showed Liv what to do, she absolutely loved it and is showing everyone her decorations she made. I was looking for something different for a table centre piece when I came across this plastic cocktail bowl. 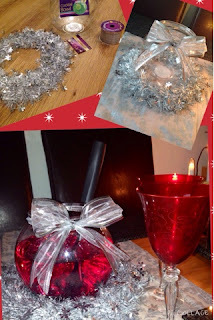 I found a silver tinsel wreath for it to stand in and picked up a silver wired ribbon to tie around the bowl. Then I added some punch to the bowl, a ladle for serving and some festive wine glasses - it looked lovely and went down a storm at the weekend. 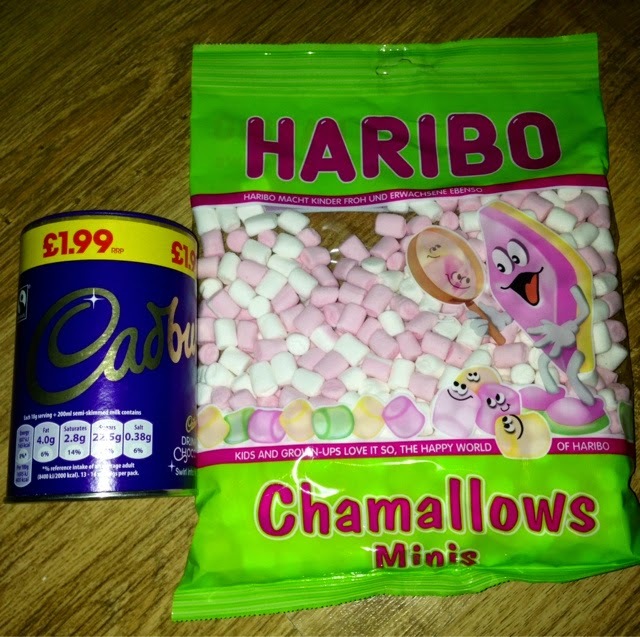 We also picked up some Cadburys Hot chocolate (should be £1.99 as you can see on the tub) and small marshmallows for our traditional Christmas Eve drink. 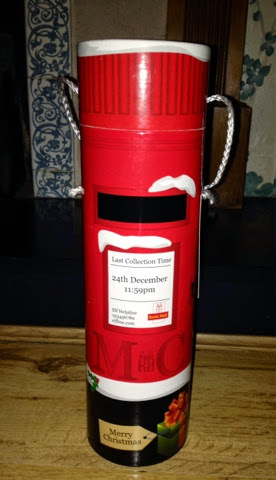 I also picked up this Postbox bottle gift box, it is a lovely design and will come in handy as I hate wrapping bottles. 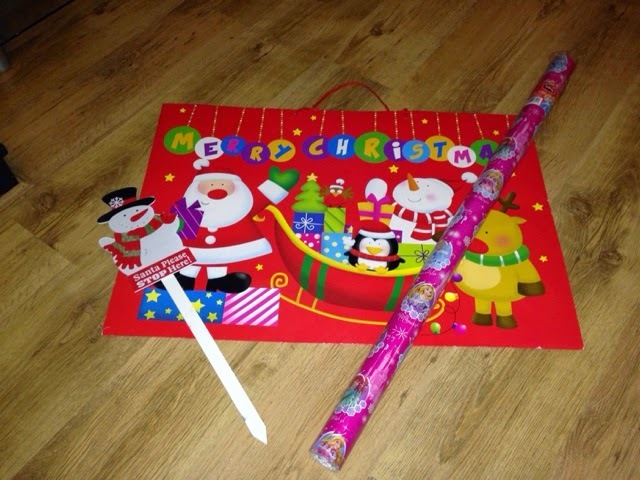 I also chose a Large gift bag for carrying gfts around on Christmas Day - last year our bag broke on the way out of the door and we ended up carrying a black bin liner around - festive! Liv chose a "Santa please stop here" sign and a roll of Princess paper - essential when you have a 3 year old Daughter. 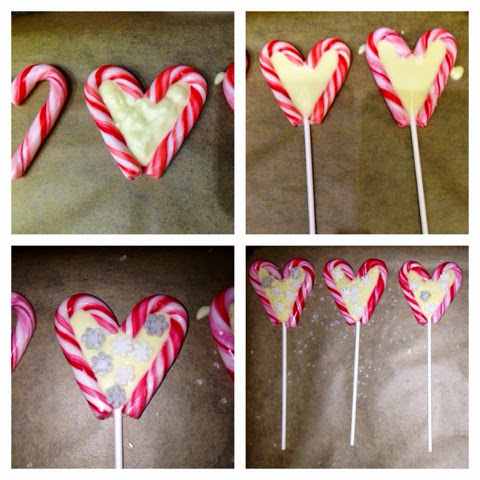 We followed an idea on Poundlands YouTube channel to make some gifts from a box of mini candy canes and some cake pop sticks. Pop the candy canes onto some grease proof paper in the shape of hearts. Using the end of a cake pop stick, I swirled the chocolate to level it out, then placed the stick in place. Lastly we decorated with some Christmas sprinkles we had in the cupboard and popped in the fridge so the chocolate could set. They look lovely and were so easy to do. 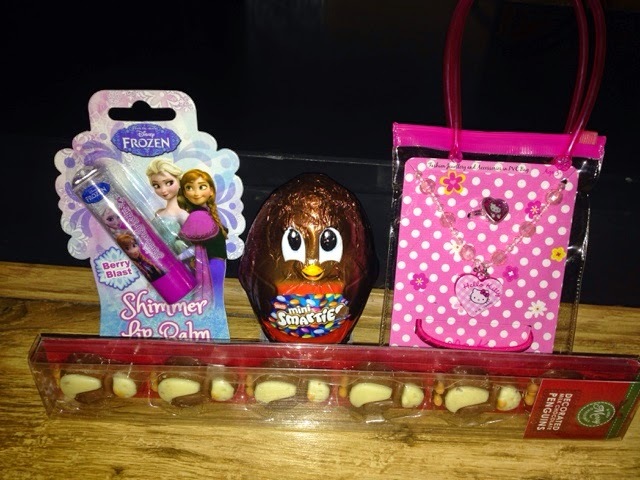 Olivia has a Frozen (clear) lip balm, Penguin shaped chocolates, a chocolate Smarties penguin and a Hello Kitty bag containing a necklace, ring and hair bobble. 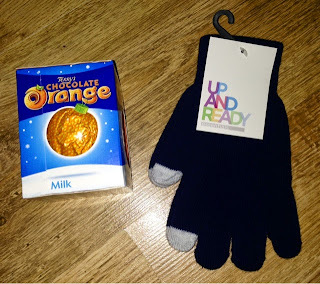 Daddy always has a Chocolate Orange as a stocking gift - it is tradition! This year I have also added these super clever smart phone compatible gloves. I have seen these elsewhere at a lot more than £1. He is a Salesman so is outside in all weather and uses his phones calculator through the day, of course this means taking his gloves off which leaves his hands freezing. These gloves have some magic in the forefinger and thumbs which allows you to use your smartphone or tablet while still wearing them! 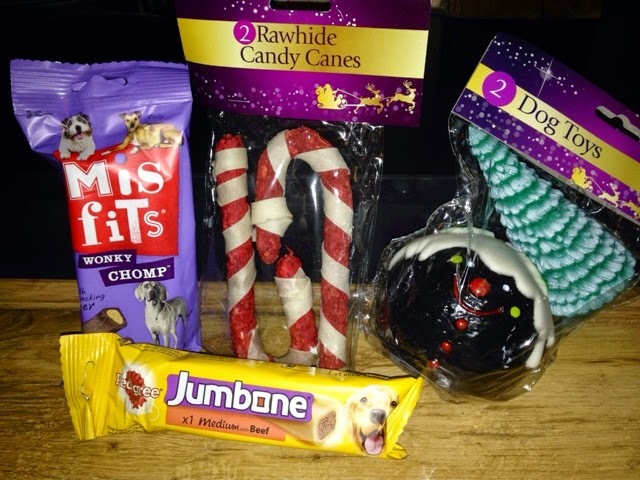 Charlie the Dog has aChristmas stocking too (bought from Poundland 5 years ago!) This year he will be receiving some Miss fit chews, 2 candy cane treats, a squeaky Christmas pudding and Christmas tree toys and a Jumbone - happy Charlie! Livs Grandad has a very sweet tooth so alongside his real gifts, I always get him a couple of sweet treat. Liv will no doubt try to help him polish them off. This year he will be getting some Walnut Whips and a box of Maltesers. We had great fun taking part in this challenge and will be visiting many more time before Christmas as the value is always so fantastic. 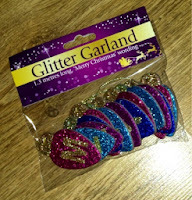 Why not check out Poundlands other great ideas? You can find them on Facebook, Twitter, and Pinterest. Disclaimer - we were provided with £30 vouchers to but products however all images and opinion are our own.